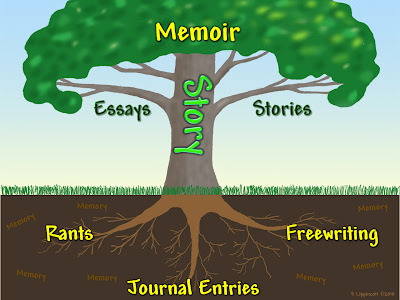 Guest post by Denis Ledoux, founder of The Memoir Network. Just as with so many big projects in life, you’ll benefit by taking a moment to consider why you ought to start—or continue—to write this memoir of yours that is intriguing you and what role you anticipate it will play in your life. I like to think of my thoughts below as one of the roots of the Tree Of Life Writing that needs to be nurtured. You may not know it yet, but your impulse to write is probably solid. In late autumn of 1988, as people were hunkering down for another Maine winter, I was asked to read from my first collection of short stories (What Became of Them) to a gathering of volunteer Foster Grandparents. My collection clearly made use of autobiography—the approach to fiction that has always compelled me the most. Several dozen men and women, sitting at long tables, many smiling in recognition of elements in the stories I had just shared, said in one way or another, “These are people just like us!” They seemed to recognize the child climbing the apple tree at the edge of the meadow or to glimpse once again their own parents in the tired women and men trudging through the tenement district on their way back from the textile factory. Most of the basic material writers work with is acquired before they reach the age of fifteen. After the short program of reading from my book of short stories, as has been my custom, I asked people to share their own stories with me and with each other. An astounding—but, as I was to find over and over again, completely natural—response occurred. In a torrent, members of the audience began to tell me their life stories. These Foster Grandparents spoke with eagerness—as if speaking their stories was, at last, satisfying a hunger of long standing. Or, perhaps it was a need to preserve their story, to achieve some snippet of immortality if only in the telling to their fellow Foster Grandparents. Their memories were set in a number of countries around the world and in a variety of cultures within the US. As people spoke, some grew animated while others exuded peace. Some spoke with pride; others with sorrow. All, however, seemed to need to tell the stories of their lives and of their families. Once again, storytelling had “primed the pump” of memory to enable personal and family stories to pour out. After my reading that day, I left for home feeling justified in my faith in the primal function of storytelling to affirm and reaffirm meaning in our lives. Like the Foster Grandparents, if you need to write—or tell—lifestories because you need to establish a “monument” to your experience in the “city park” of your memory—and of the world’s memory—then you have a reason that may well see you to the end. My big takeaway that can be yours, too. I have come to also realize something more about writing, something that is a corollary of this need to be public: telling your story to yourself (in the privacy of your office, for instance) does not satisfy that hunger to tell. People need to tell their stories to an audience. Sometimes that audience is your own family; sometimes that audience is much larger—as large as a city, a region, a whole country, or even the world. Is that why you want to write: to share with a larger audience? If so, that is natural and good. ~ who needs to hear your story? ~ whom do you need to share this story with? Our distant ancestors told stories around the campfire. They did not tell stories just for themselves, sitting in the woods far from others: they told stories to an assembled group because they understood that telling and hearing were part of a process. Yes, it can be intimidating to realize that your words are going to be read by an audience of real, live people—people who, in some cases, will criticize you. But, these real people—both those with appreciative remarks and those with cutting riposts—are part of your writing experience. Write for an audience (even if sometimes that audience is only you). Don’t let fear of judgement stop you. Pursue your dream of sharing your story. Writing a memoir is important work. Do it! 1. Whom are you writing for? Be insightful now: whether your answer is my grandchldren or the Noble LiteraturePrize Committee. State why you have this audience in mind. What difference will this memoir of yours make for this audience? Denis Ledoux is the author, most recently, of How to Start to Write Your Memoir which is Book One in the seven-part Memoir Network Writing Series. This post is adapted from that e-book. Also in publication is Don't Let Writer's Block Stop You. A complete list of publications is available. To be placed on an alert list, send an email. Very nice column ~ like the appearance of the article. Great quotes from the author. Thanks Joie. You can always count on good stuff from Denis. Joie, I'm glad you liked the post. I hope the piece will support your memoir writing. Thanks for the inspiration. I'll share it with my "tribe." I'm going to use a quote from this article in my Purple Passages post for March - with attribution and links of course. Thanks, Sharon, for hosting Denis today! You are so welcome Marian. We'll look forward to that issue.